The new Tomb Raider is a classic recreation of the themes present in Campbell’s The Hero’s Journey – but wow, what an experience. This game caught me by complete surprise. I’m not sure why, I just wasn’t expecting to be blown away. I was. With stunning vistas & graphics that are an assault on your senses, things that spring to mind include, grittiness, the weather, the zip line, a created artificial history that feels right, intense, fast-paced, seamless integration of cinematic sequences with gameplay, the weather, the feeling of being an explorer in an open world (although it’s essentially on rails), choice v illusion of choice, control (or lack of), fantastic violence & interactive media. It’s this last point that has me intrigued for the future direction of games. Gaining in popularity it seems is this trend of immersing the player in what can be best described as an interactive narrative/movie. The nuanced view in the literature between Interactive Narrative Design, Interactive Storytelling, Interactive Media & the debates that rage between academics & designers about whether a game’s primary aim should be to tell a story or whether the stories in games can ever be as meaningful as the stories in film and literature are irrelevant to me. 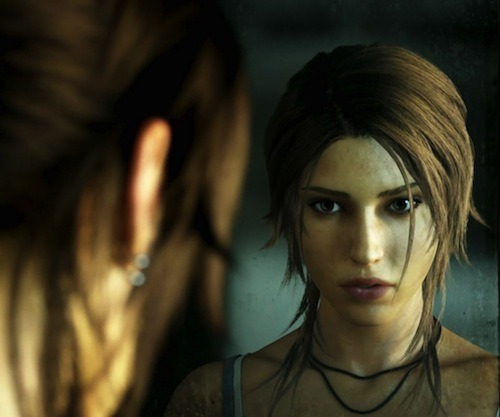 I don’t really care about the opposite views of Ludologists & Narratologists (see Game Design As Narrative Architecture by Jenkins), what i was drawn into in Tomb Raider was a form of entertainment in which I felt like I was influencing a dramatic storyline through interactions with the narrative. The game wasn’t difficult or long – but it didn’t need to be. What exactly is interactivity in games? How much control should be afforded to players? As players, how much control do we actually want? In Less C, More IT, I tried to express that exploring technology is not just about using technology. If we get the opportunity to create technology this allows for a deeper understanding and gives the ability to fundamentally restructure the world around us. 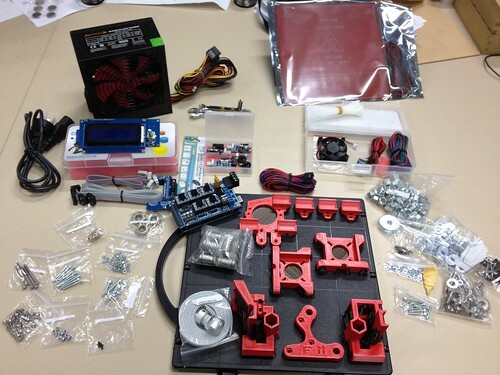 Quantum Victoria is running what we believe to be one of the first offerings in the world for K12 education – a 4 day teacher professional development program where teachers get to build a 3D Printer for their school using 3D printed parts, open source electronics and other miscellaneous pieces. Risky? Yes, but we wouldn’t have it any other way. 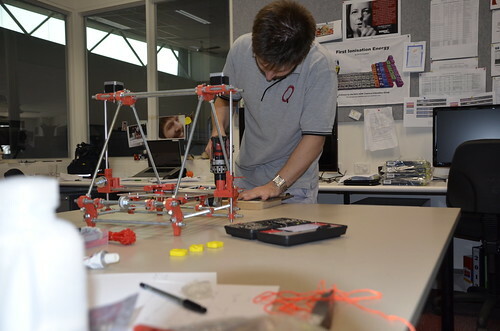 Led by the brilliant Paul Taylor (@DrBlackAdder), and starting Monday week, teachers will get to explore and learn the inner workings of 3D extrusion printing, the basics of 3D modelling, and explore many of the educational applications of 3D printing. At the end of the program teachers take home a brand new self‐built 3D printer (prusa mendel style), and all of the skills that they require to get their school printing. This is what technology now allows and we are essentially creating the ability for schools to produce self-replicating 3D printers at a fraction of the cost of retail. 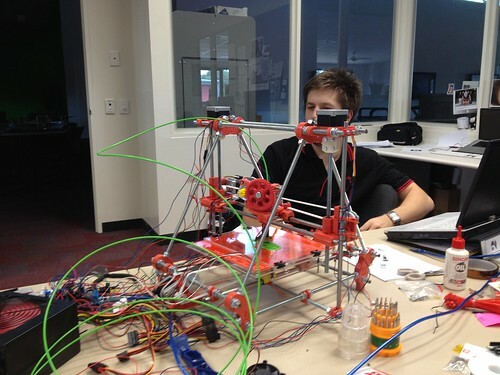 Joel Willis assembling his first 3D printer. Often 3D printing is seen only in terms of the end product that it produces. These results can often be amazing – see a previous post 123D Elephanticus. But a 3D printer combined with modelling skills, lateral thinking and problem solving ability, becomes an all-purpose machine that really puts power into the hands of amateur creators and allows them to create solutions to real-world problems. It shouldn’t be thought of in terms of the end product, but more in terms of what it can do once you see it for what it is. The number of places for the program were filled fast and I look forward to sharing the successes/challenges or otherwise. Themes of ‘connectedness’ at conferences around Australia the past few years (think “Now it’s Personal’ or ‘Creative Connections’) combined with an obsession in attracting social media experts to keynote, has shifted the discussion of computing in schools in the wrong direction. The over-emphasis of the ‘C’ in ‘ICT’ has turned much of the dialogue in the direction of the end user, of students being slaves to the machine, the big companies & software developers, instead of developing an understanding of how to make technology work for them. I’m wondering if we can put the ‘C’ aside, move forward and stop being amazed every time we turn on Skype or get students to write on a blog. Surely it’s about more than that? Learning isn’t all about connections or ‘connectedness.’ To say it is is nonsense. Learning in its initial stages is solitary. You have to do something, try, struggle, stay with the problem, have persistance, emotional resolve and feel frustrated with something for it to take hold in your brain and then, and only then, can the ‘power of the network’ assist. There are no shortcuts. I don’t think it is desirable for students to be but echos in a world wide chamber of derivative and second hand ideas – what would be desirable is for them to be master learners and knowledge builders who know how to ask the right questions. Computers can empower. But if we see them as just communication tools then we miss the chance to fundamentally restructure the world around us and to put power into the hands of amateurs creators. Be connected for sure, make students culturally aware, but too much focus on connectedness is to the detriment of learning. One skill I wish I had of developed as a child is the ability to touch type. Don’t get me wrong, I had a wonderful education, learnt to program and many other really valuable skills, but just never became a proficient touch-typer. Is touch typing still a valuable skill when it seems we are moving inexorably to touch screens and very soon augmented-gesture and brain-controlled interfaces? If it is (which I think it is), Typing of the Dead is fun. 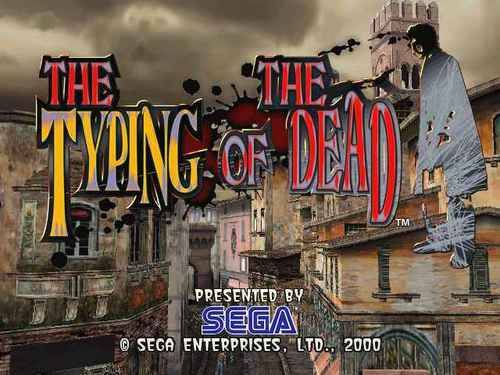 The Typing of the Dead is an older game that is really a mod of the arcade classic House of the Dead. The game is styled on a railed first person shooter, but instead of shooting zombies with weapons you need to type out phrases and words to kill them. Doesn’t sounds very good – but it is surprisingly likeable and could be a nice addition to any teaching & learning about touch typing.